The Charlotte 49ers athletics department and University Provost Office will host the Solace for Children teens group on campus on July 27. Halton Arena will be one of the venues visited by the children as part of their tour of campus that day. The teens, from an original group of 34 children, are refugees from Afghanistan who are in Charlotte to receive needed medical care donated by local doctors. 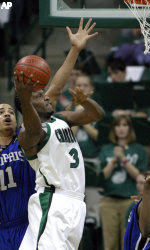 Former 49ers basketball player Curtis Withers, who took Russian while at Charlotte and played overseas in Turkey (who speak similar languages to the teens), will be part of the entertainment and take part in a dunking display. Other members of 49ers teams will be on hand for the kids' visit, which will stop by Halton Arena from 11:30 a.m. to 12:30 p.m. The children will tour the computer and Information Technology facilities in Woodward Hall and also see the Health and Human Services department at the university as part of their day on campus. Solace for Children is a non-profit organization in Lake Norman which has helped over 60 Afghan children over the past three years. Curt's the man. Wonder if he is still playing somewhere. 2008/2009 Curt was playing in Israel.